The following post is from the Ethernet Alliance. A two-sided, illustrated map that illustrates the speeds on the front side and the Ethernet ecosystem on the backside. This map is available in pdf format as well as a folded, printed map that will be given away at various Ethernet Alliance events. A white paper that explains more of the details of the roadmap and parallels the folded roadmap. A presentation that has a variety of graphics from the map for people to use in presentations. The map has enough resolution to print on a 24” x 36” poster. Free copies of the folded map will be given away at various events this year including OFC, OIF, ETS, SC and IEEE. 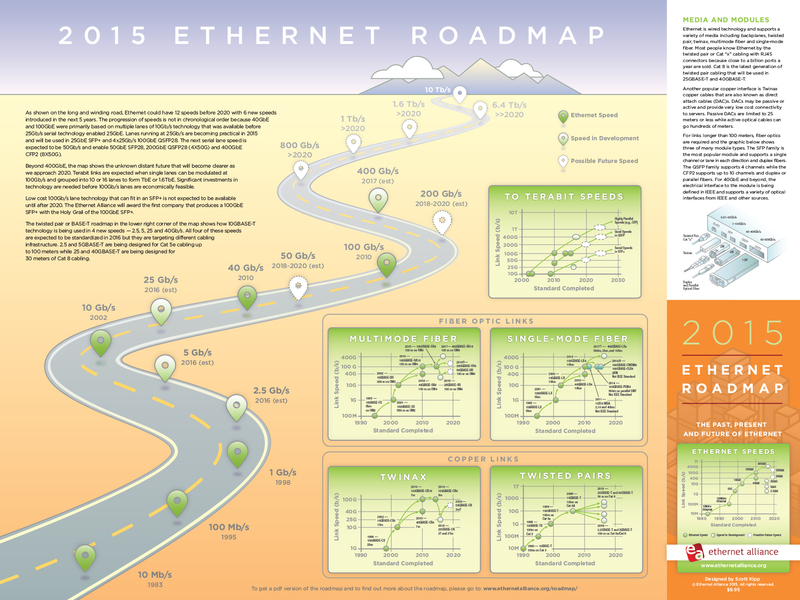 This map was based on work done in the Ethernet Alliance’s Roadmap Subcommittee. More information on the Roadmap Subcommittee can be found here.